Blue Velvet Damsel Fish is found in the Western Central Pacific. It lives in the Indo-Australian archipelago, including Indonesia, the Philippines and the Ashmore Reef. Blue Velvet Damsel Fish inhabits protected reef flats of lagoons and inshore reefs. It prefers current swept reef flats a few meters down. The depth range for this species is 0-4 meters / 0-13 feet. 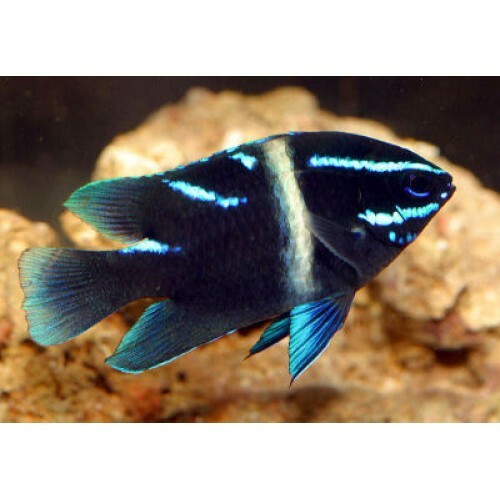 It is not advisable to house Blue Velvet Damsel Fish in aquariums smaller than 30 gallons / 115 liters. The fish should have access to suitable hiding spots as well as plenty of open water for swimming. It is considered reef safe. The Blue Velvet Damsel Fish is a hardy species, but you should keep in mind that it is also territorial and quite aggressive. It is not recommended for peaceful community aquariums. Older specimens can be really aggressive and it is safest to keep such individuals alone or in compatible pairs. Keep the water temperature in the 72-78° F / 22-25.5° C range, the pH-value at 8.1-8.4, and the specific gravity between 1.020 and 1.025.